It shouldn't surprise us that there are a plethora of rumors bandied about about the status of Sidney Crosby. Despite the report from those closest to the situation, there does still remains a bit of mystery to the whole situation. I suppose what confuses us fans most is the lack of certainty surrounding his current status. No one from the Penguins organization is ready to say that Crosby will be back on the ice for training camp and ready for the start of the season. Reason being, they don't know if he will. They're more concerned about his long term status than the start of next season. And rightly so. But this unfortunately leave room for endless rumors to surface. As I said earlier today on twitter to Jesse Marshall [from Faceoff Factor] after he went on a moderate tirade regarding the Crosby rumors, all media outlets (including pseudo-outlets) are looking for some attention when hockey news is at a stand still. If your outlet has the "inside info" on Crosby, it's going to garnish attention. Probably lots of attention, too. 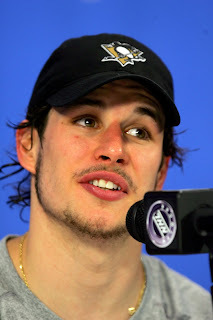 The status of Crosby is indeed a big deal, for the Penguins organization and the NHL as a whole. While there's been some NHL players that have arisen as stars in the past few years, not one of them has accomplished as much or lived up the the hype as much as Sidney Crosby. Despite his recent absence, he still remains the face of the NHL. When an injury such as a concussion that has ended the careers of so many athletes over the years hits a superstar like this, everyone is going to notice. If Michael Jordan were to sustain an injury in 1992 that lasted more than a half a season and his status for the following year was "unknown," people would have talked just as much. But since the advent of Social Media has arisen, it's difficult at times to know who's legit or not. So while there's no reason to pretend the Crosby rumors are going away, you can in fact guard yourself against them. Until we get a direct announcement from Sid's agent Pat Brisson or the Penguins organization itself, just assume it's a bunch of poppycock.